Golf's handicap system allows players to compete equitably in a match-play competition, whether two or four players are involved. Amateur golfers all over the world use handicaps. They allow players of widely differing skill levels to have competitive games against each other. Unlike stroke play, the actual number of strokes taken in a match isn't the recorded score. Handicaps are used a little differently in a match-play competition. The United States Golf Association defines a handicap index as "a number that represents the potential ability of a player" on a course with of average difficulty -- those with a slope rating of 113. The index is a number with one decimal place, such as 14.3, used with a Course Handicap Table (supplied by the USGA) to find the handicap you should use on the particular course you are playing. You and your opponent should do this before starting your match. The USGA issues two different types of handicap indexes – 18-hole, which most players think of when they hear the term "Handicap Index," and nine-hole indexes, which have a (N) after the number. If you have only a nine-hole handicap index, double it for 18-hole matches. If you have only an 18-hole index, halve it for nine-hole matches. 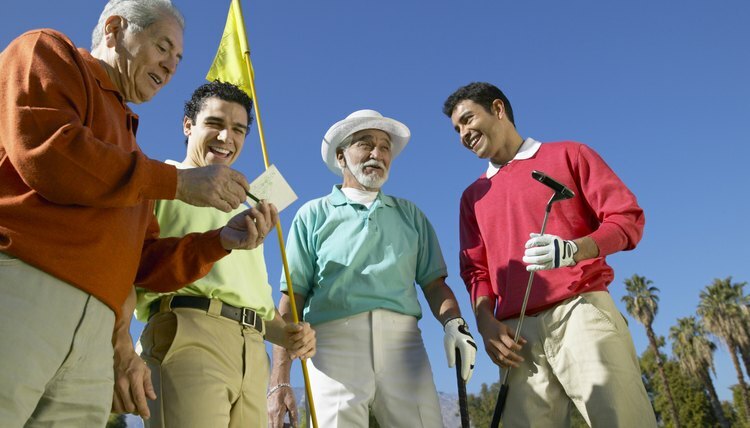 In stroke play, your handicap is clear enough – it tells you how many strokes you get against the field. But in a singles match, there are only two players. The player with the lowest handicap becomes the baseline handicap and plays at scratch, meaning he doesn't get any handicap strokes. The other player gets his handicap strokes by subtracting the other player's handicap from his. For example, your handicap for this course is 15 and your opponent's is a 6. Subtract 6 from 15; your handicap is 9 and your opponent plays scratch. Each hole has a handicap number indicated on the scorecard. You subtract a stroke from your score on each hole for which you are allocated a handicap stroke to get your net score for that hole. For example, if you gets nine strokes, you subtract a stroke from your score on each of the nine most difficult holes -- that is, the "1" handicap hole through the "9" handicap hole. If you are entitled to more than 18 strokes, you subtract the additional strokes from the most difficult holes in order of difficulty. If you received 20 handicap strokes, for example, you get two strokes on the "1" and "2" handicap holes and a single stroke on the rest of the holes. Foursomes matches (alternate shots) add a new wrinkle. Since each team plays a single ball and alternates shots (you hit the drive, your partner hits the approach, you putt, etc. ), individual handicaps cannot be used. In this case, a handicap allowance is used. The handicaps of both team members are added together; the team with the lowest combined handicaps plays at scratch. The other team then subtracts the low team's handicap from theirs, divides the difference in two, then rounds up to the next full stroke. Using our teams of 15 and 6 (21 total) versus 7 and 9 (16 total), the 16 team plays at scratch. The 21 team's handicap becomes 3 (21-16 = 5; 50 percent of 5 is 2.5, which rounds up to 3). If the players are allowed to both hit their drives, then select which drive to use – making the format somewhat easier – the combined handicap would be 40 percent of the total rather than 50 percent. The team with the highest combined handicap would then get 2 strokes instead of 3 (40 percent of 5 is 2).